Iris Jortner, cellist, is a native of Israel. She has performed in important venues in Israel, Europe, China, Australia, and the United States. 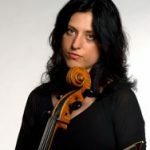 Ms. Jortner has collaborated with Yefim Bronfman, Michael Tree, Itamar Golan, Levon Chilingrian, the Orion Quartet, the Avalon Quartet, and the Apple Hill Chamber Players. Iris was a member of the Aviv Quartet from 1997-2002. She has recorded the Hoffmeister Quartets for Naxos, and music for oud, cello and piano by Middle Eastern and Western composers for Live Classics. Iris taught cello at the Island Arts Music School (founded by Robin Russell), and cello and chamber music at the University of Virginia. In the summers, she is on the faculty of the the Apple Hill festival in New Hampshire. She performed in numerous festivals including Verbier, Banff, Tanglewood, Taos, Prussia Cove, Dubrovnick, Kfar Blum, and Jerusalem International Chamber Music Festival, “Encounters”, Rolandseck, and Schlern. Her teachers include Uri Vardi, Aldo Parisot, Bernard Greenehouse, Paul Katz, Timothy Eddy, and members of the Alban Berg Quartet. She is artistic director of the Rosemarie and Robin Russell chamber concerts on Roosevelt Island, NY and is a member of the Appasionata trio.